Hartford head coach Lewis E. Whitson and his assistant, Colten Barrett, will often self-scout and ask how they would defend their team. The Jaguars feature plenty of experience, led by two seniors: quarterback Danen Kistner and all-purpose threat Clayton Fowler. Barrett has a simple solution: stop Fowler, a back who had more than 1,600 total yards and 30 scores as a junior and is on pace for another big season. However, Whitson questions Barrett on his scheme. Barrett would assign one player to defend Fowler. Barrett has no answer – and neither has opponents’ defenses. This week, though, Whitson sees a similar circumstance when the Jaguars play host to No. 5 Caldwell in a critical Eight-Man, Division II, District 2 matchup. Caldwell is 6-0, 2-0 in district play, while Hartford is 5-1, 2-0. The Blue Jays will make the 161-mile journey from near the Oklahoma border to close to Emporia. Last week, Hartford defeated previously unbeaten Hutchinson Central Christian, 94-60, in a key road district contest. The Jaguars set a school record for single game points. 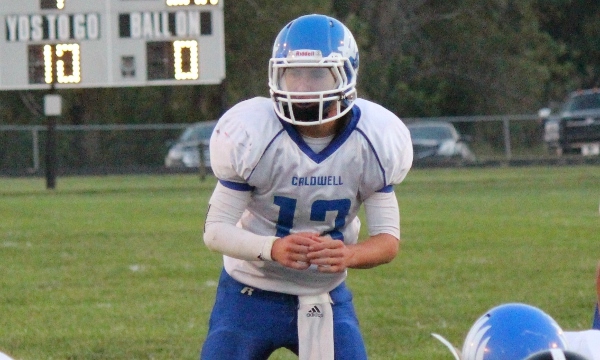 Caldwell, which scored 90 points at Argonia-Attica in Week 2, is Kansas’ highest-scoring offense with 376 points. Hartford ranks fourth in the classification with 334 points. Caldwell senior Colten Ward, a threat passing, running, and in the return game, presents an unsolvable situation for opponents. Additionally, junior running back Dakota Volavka is another challenge. Ward has completed 19 of 24 passes for 506 yards and 11 scores. He has 47 carries for 823 yards and 16 touchdowns. Senior end Dilyn Volavka (knee) has missed the last several weeks and could return Friday. Last week, Fowler had 293 offensive yards, including 212 on the ground, with nine offensive scores in the win versus Central Christian. Kistner finished 18 of 31 passing for three touchdowns. The offensive line spread out the Cougars in the first half and passed often, and then ran more in the second half. Whitson said the line “didn’t miss a beat” with senior center Drayden Butterfield and three guards: Landon Ledford, Dalen Kistner and Zack Larson. Junior Justice Kemmerer has performed well at blocking back. Ledford has come back from injury and helped Hartford on both lines. Hartford recovered four onside kicks and Kistner returned a Central Christian onside kick for a touchdown. Special teams could be key on Friday, but Whitson wants to neutralize Ward in the returns. Caldwell has prepared for onside kicks this week. “We definitely have plans not to kick it to them,” Whitson said. “We cannot allow them to score, and then get the ball right back,” Blosser added. Whitson didn’t want to have a high scoring game with the Cougars, who rank second in scoring with 340 points, but that’s what occurred. He expects another high-wattage game versus Caldwell. However, both squads, especially Caldwell, have shown improvement from last year when Hartford went 7-3 and Caldwell was 5-6. Caldwell permitted 43 points a game last season and has allowed just 11 in 2016, third-best in the classification. The top-three scoring defensive squads – Hanover, Dighton and Caldwell, are the lone undefeated teams in Division II. Hartford has allowed 31 points a contest, including a 62-12 Week 2 home loss versus Burlingame. Hartford has an average score of 56-31 after an average margin of 39-27 in 2015. Last week, Caldwell defeated a solid Norwich team, 52-6, behind its staples: big first quarters, its quick-strike offense, key plays from Ward and a defense that has kept teams from scoring. Caldwell, which has often run fewer plays than its opponent, had 25 snaps for 383 yards. Blosser said the Blue Jays have played at their highest tempo virtually all season. Overall, he said Caldwell plans “to move the ball fast” and “get the defense to play on their heels” each contest. The Blue Jays have led after every first quarter, including 74-6 in the last two weeks. Norwich (3-3) had 30 plays for 76 yards. Ward scored on runs of 44, 19, 60 and 53 yards and threw a 54-yard scoring pass. Caldwell’s defense stopped Norwich once when they got to the goal line and hasn’t permitted an offensive score since Week 3. Blosser has called his defense more physical the last several weeks.